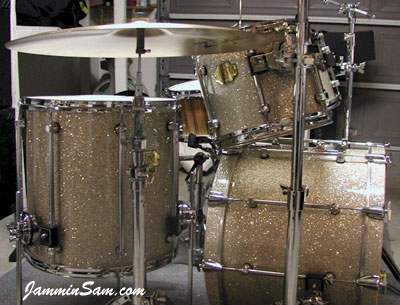 Picture sent in (January 2005) by Dan Hertlein of Antioch, California of his Premier drum set. Great pictures Dan! 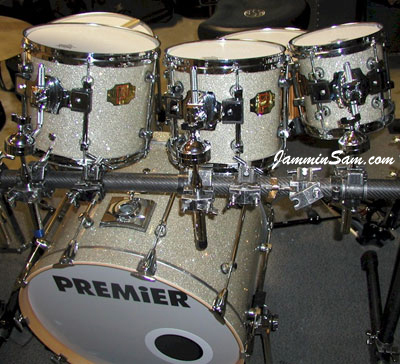 This is a Premier Signia kit that used to be Premier’s top of the line kit until they stopped making them. It was originally a white lacquer finish. The problem was I added tow drums to the kit, they were different colors. 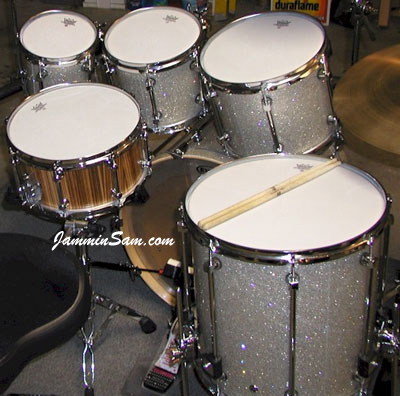 Getting the other two drums to match in the white lacquer would have been too expensive and the results would have been 50-50. Since I’ve always liked the silver glass glitter, this was a no brainier. Everyone who sees this kit comments on how nice it looks (also how great they sound). This is my fourth project using your wraps. There’s got to be a reason for that! P.S. For your information, that snare drum in the picture is a Rob Schuh Zebrawood Stave drum. He makes great drums by the way. Our Silver Glass Glitter may also be known as Broken Glass or Sparkle Glass.